Have you ever felt truly inspired in front of a work of art? Have you been a victim to Stendhal Syndrome in the Uffizi, fallen in love with Michelangelo’s David, or remained entranced for an hour in front of a painting? When I first came to Italy as a study abroad student in the Summer of 1997, I trekked unflaggingly up the hills of Rome to explore cold Medieval churches and spent hours seeking out Florence’s lesser known convents, churches and museums. Studying a lot of art history had the effect of taking this initial awe and inspiration out of me. Knowledge overtook emotion, and it’s been something I have been working on getting back as I’ve moved away from an academic career in the past years. Visiting museums and historical sites with non-experts, teaching them about the works but also getting to take part in their reactions, has helped me. But there are moments when frankly, I feel a bit uninspired, so maybe you can help. This month’s ArtSmart Travel Roundtable topic is “art that inspires” and this has led me to think about how I might find some art that inspires me in my adopted town of Florence at a time when I feel like I’ve really seen it all. I wonder if this is something other expats experience, or even if, wherever you are in the world, you find yourself occasionally bored of your city and in need of a method to re-approach it (by joel). It’s rare that I write about something without a solution or concrete tips; I’m trying to figure out a few, and maybe you can add your own, or use this as a reflection for yourself. Before you accuse me of having some serious first-world #expatproblems and tell me to stop complaining because I live in one of the world’s top destinations, let me put this reflection further into context. The other day, two blogger friends, Tiana and Nardia, and I went to check out the new Museo del Novecento, but it was unexpectedly closed. I had happily accepted to tag along on their visit because lately I have found that Florence has not been giving me much fodder for blog posts. I’ve run out of new stuff and covered all the old. Not a lot of exhibitions have opened up since early Spring and I have been too busy with work to travel anywhere. Faced with a morning to kill in town, we racked our brains for places we hadn’t seen yet. They’ve been here for just over two years, whereas I have about fifteen on my record, but even they said there were not a lot of places left on their lists. I think I have seen everything there is to see in Florence. Or let’s rephrase that. Anything that is worth seeing, in my very fussy, personal opinion. If it’s art and it’s at all historic, I’ve seen it many times, and probably studied it or its historical context in depth. I may have missed a church or two, especially if it’s closed to the public, and of course there are plenty of things in storage that I don’t know about, as well as some modern and contemporary works that I perhaps ought to look into. But if you make a checklist of everything an in-depth, art-loving visitor might want to do in Florence, I’ve done it. As you can imagine, this can be a problem when I try to publish two articles on this blog every week. I never read the same book twice, but I will hit up a museum or church numerous times if I enjoy it (especially if it’s free!). Generally though, I won’t write about the same topic more than once, even across different blogs. As I have been writing about Florence and Tuscany for 10 years, regularly on 5 different websites and averaging 3 articles week, you can imagine that I’m running out of interesting material. 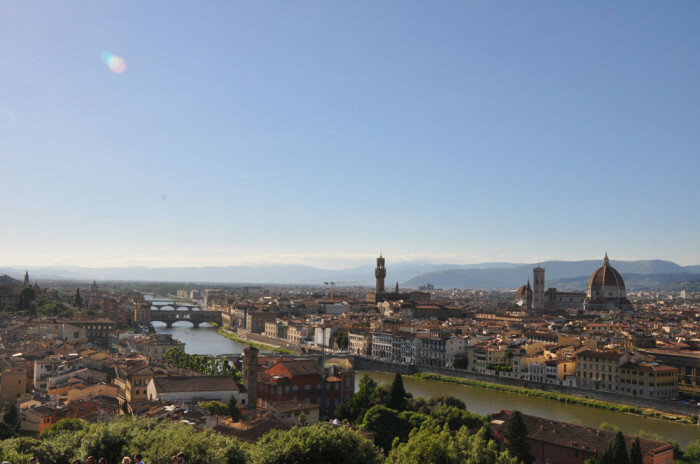 I’m not entirely jaded or immune to the art and beauty of this place – I especially enjoy the beautiful landscape outside the city and I rarely tire of the much-photographed view of Florence from Piazzale Michelangelo. But perhaps as I get further away from my academic studies of Renaissance Italy, which I connect to its art and that influence how I write about it, I need new ways to approach the art and culture I see. Here are some of my musings that I hope will get me out of the house and looking at art in a new way soon, with fresh ideas to write about. Are these methods that would work for you? 2) New eyes. I could borrow a child, a tourist, or a less jaded friend and try to open my eyes to the way they see art in Florence for the first time. Even if I won’t go back in time to experience inspiration in the same way, maybe I could learn from this or find new ways to help people look at art. This, might I add, would be a really big challenge, because people always look to me as a guide, and I tend to take over that teacher position. 3) Slightly different art. My field of study and interest has always been Italian Renaissance Art. I tend to write about the things that I know and like in Florence (that’s mostly Renaissance), as well as exhibition reviews (sometimes of art from different periods), and of course new things I discover when I go out of town. I’m frankly not a big fan of 19th and 20th century art, living artists or crafts (writing about craftspersons is just not what I do), but there may be other areas of creativity in the city that I could explore and report. 4) Annual cultural events. Special openings and visits offer oft-closed secrets to prying eyes. There used to be a contemporary art studio visit series by the CCC Strozzina, and something like that would be a nice way to discover new art in the city (sadly, the CCC Strozzina is temporary closed for lack of funding). Various associations in Italy hold national events like the ADSI Giardini e Cortili Aperti or the Giornate FAI di Primavera. Although I’m very up to date on what’s happening in Florence, these national events seem to make use of communication methods foreign to me (TV, pamphlets in banks) and I always find out about them when it’s too late, so I am thinking I shall make a calendar of these. Do you know of any other good ones? 5) Reading. I know I should do it. That and traveling are the two greatest ways to be inspired by art… and thus find more fodder for blog posts. Unfortunately, I’m a little short on time these days. I am truly regretting my choice to not respect the traditional month-long Ferragosto holiday because I have too many projects with deadlines in September and October. This is one of my own points that I know I won’t be able to respect. Now for your ideas! Can you help by suggesting either new approaches, or specific topics or series that you’d like to see on this blog?